As the arrival of spring battles with hail and snow, and tender shoots cringe in shock against untimely cruel northern winds, our NatureAlert campaign is reaching its moment of truth, and may well shortly bear the fruit of its success. 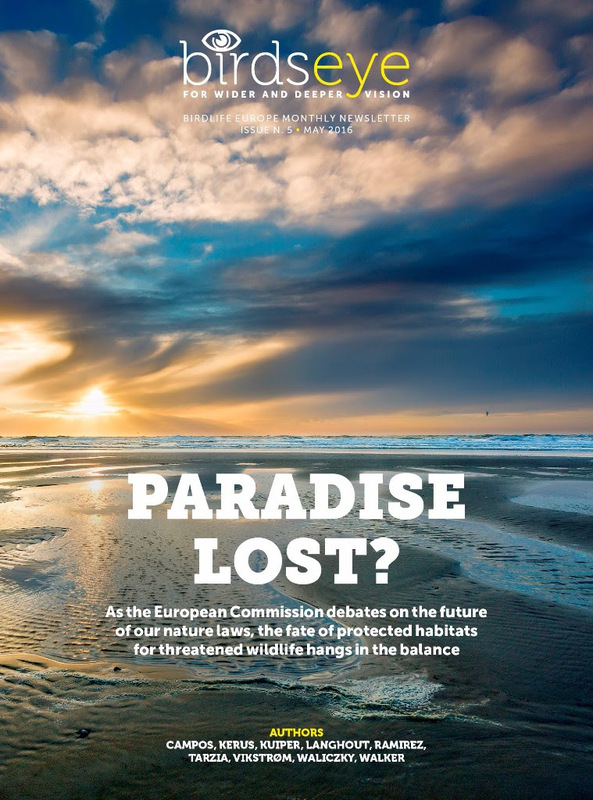 In June, we expect the European Commission’s endorsement of the EU’s Nature Directives – the EU laws that have established the Natura 2000 network of protected habitats – as ‘fit for purpose”. Will it backtrack on one of the EU’s biggest success stories? Or will it announce a new era of better enforcement and implementation of laws in the EU? What hangs in balance is the future of our best natural places such as Important Bird and Biodiversity Areas (IBAs). Building on the successful concept of IBAs (the EU has recognised IBAs as the reference for the establishment of Special Protection Areas under the Natura 2000 network), BirdLife is collaborating with other leading conservation organisations to develop a comprehensive programme to identify and protect Key Biodiversity Areas (KBAs) in Europe and around the world. We are proud that since 1981, BirdLife has successfully worked to identify, map, monitor and protect IBAs. Using a standardised scientific approach to recognise the most important sites for birds, our work, which started in Europe as part of the implementation of the Birds Directive, is now global in scope. Much of this work depends on field research by our network of thousands of passionate volunteers: we thank you. These natural paradises are under huge and rapidly increasing threats. Conversion of land to areas of intensive agriculture or housing, building new roads and dams through them, illegal logging and taking, and a host of other human-induced pressures are destroying habitats and driving species toward extinction. IBAs are a groundbreaking scientific enterprise and a very successful engine of conservation. All over the world, IBAs have guided the establishment of protected areas and the prioritisation of conservation efforts. For example, IBAs are helping establish the Emerald network and have been written into the legislation of countries such as Kazakhstan. On 21 May, we will celebrate the crown jewels of Europe’s nature: the Natura 2000 network. Our IBAs in danger initiative helps focus attention on the most threatened and precious sites. Our Partners work with local communities and volunteers on the ground, drawing strength from the solidarity and expertise of our global network. And while we campaign to save individual sites, we also campaign for a proper implementation of the laws that protect them. 10-13 May, 2016: The European Association for Zoos and Aquaria Conservation Forum 'Building Bridges', BioParc Fuengirola, Spain. The forum is now accepting abstracts for oral presentations, workshops, round table topics, posters, short movies and documentaries. 23 May, 2016: The 2016 Natura 2000 Awards ceremony, Brussels. Register here to attend and click here to vote for the most deserving project. 22-26 August, 2016: Freising-Germany Society for Ecological Restoration's 10th European Conference on Ecological Restoration, Technische Universität München, Campus Freising-Weihenstephan. 5-10 September, 2016: 20th International Conference of the European Bird Census Council 'Birds in a changing world', University of Halle (Saale), Germany. The deadline for submitting an abstract for talks, speed talks and posters is 30 March, 2016. 1-10 September, 2016: IUCN World Conservation Congress, Hawaii, USA. The Congress is now accepting applications for booths. 19-23 September, 2016: 6th International Albatross and Petrel Conference, Barcelona, Spain. Registrations open. HR Advisor: This person will be part of a global team, based at our headquarters housed within the brand new David Attenborough Building in Cambridge. Specific responsibilities will include the development and implementation of a new pay structure; supporting a structural review of our regional teams; and work in partnership with line managers to support them in managing their teams and leading through change. Global Policy Intern (Volunteer): BirdLife International is pleased to announce an exciting opportunity to work on a voluntary basis with our global policy team, based at our headquarters in Cambridge, England. Our global policy team represents the BirdLife Partnership in international policy processes, and provides policy and advocacy support to our nine global conservation programmes. Closing date: 20 May 2016. Climate Policy Intern (Volunteer): BirdLife International is pleased to announce an exciting opportunity to work on a voluntary basis on climate change within our global policy team, based at our headquarters in Cambridge, England. The successful applicant will work at the interface between climate change and biodiversity conservation, playing an important role in supporting our international climate policy work and the growth of our Climate Change Programme. Penguin Campaign Coordinator: We are looking for someone to ensure that the profile of our Penguins campaign is raised within the Partner network. This person will work closely with BirdLife’s International Marine Programme team on the scientific and conservation messaging as well as the overall aims of the campaign. Closing date: 30 May 2016.